Tuesday, January 27, 1914: Read and practiced and vice versa this afternoon, and so the hours sped on. Reading and practicing the piano—sounds like a nice way to pass a cold winter day. As Grandma transitioned between activities, did she ever glance out the window and see the haunting beauty of trees swaying in the winter wind? 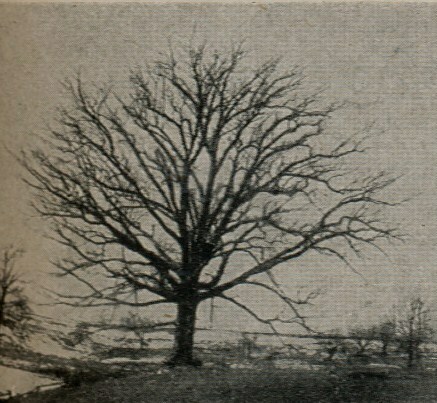 I found an interesting old book called Trees in Winter about how to identify trees during the winter months. (I can’t identity most trees even during the summer—and was amazed that some people can identify them even without their leaves). Habit—A large tree with average height of 50-75 ft. and a trunk diameter of 1-6 ft. somewhat various in habit, tending in the open to show a broad outline, sometimes 2-3 times as broad as high, with short trunk and lower limbs horizontal or declined, characteristically gnarled and twisted. Bark—Light gray or nearly white, whence its name; broken by shallow fissures into long, irregular, thick scales which readily flake off. On some trees ridges broken into short oblongs give a rougher appearance to bark. Bark up to 2 inches thick in older trees, inner bark light. The bark is rich in tannin, is of medicinal value and is used in tanning. Twigs—Of medium thickness, greenish-reddish to gray, smooth sometimes covered with a bloom. Lenticels forming conspicuous, light-colored, minute, rounded, raised dots. Leaves frequently remaining on tree throughout winter. Buds-Broadly ovate, blunt, about 3 mm. long, reddish-brown, sometimes slightly hairy. Fruit-Maturing in autumn singly or in pairs. Nut-ovoid to oblong rounded at apex, shiny, light chestnut brown, 1.5-2.5 cm. long, enclosed 1/3-1/4 of its length by deep saucer-shaped cup. Meat sweet, edible, sometimes roasted and used as a substitute for coffee, or when boiled said to be a good substitute for chestnuts. Distribution-On moist or dry ground and in various soils sometimes forming nearly pure forests. Quebec and Ontario, south to the Gulf of Mexico; west to Minnesota, Nebraska, Kansas, Arkansas and Texas. 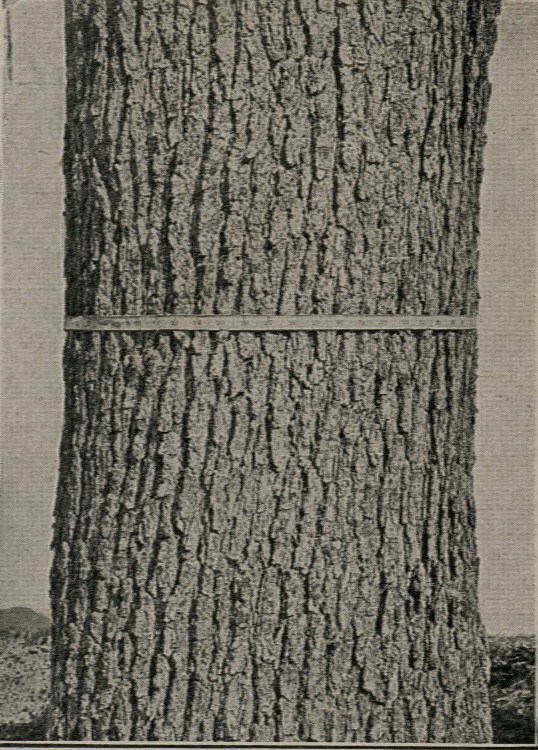 Wood-Strong, very heavy, hard, tough close-grained, durable, light brown, with thin lighter colored sapwood; the most valuable of the Oaks for timber, used in shipbuilding, for construction and in cooperage, the manufacture of carriages, agricultural implements, baskets, the interior finish of houses, cabinet making, for railroad ties and fences, and as fuel. Posted on January 27, 2014 January 26, 2014 by SherylPosted in Farming and GardeningTagged family history, genealogy. Oh go on, give it a go! Once you get your eye in, it’s not so hard. And now you have all the info. you need…..
You’re probably right. . .I’ll have to look more carefully at trees. It’s too cold to go outside right now, but this gives me something to look for the next time I take a walk around the neighborhood. Interesting information. I didn’t know the fruit of the white oak is edible. Based on the way the authors worded it, I don’t think that they ever actually ate the white oak acorns, and instead were just reporting hearsay. Makes me wonderful if the acorns didn’t taste very good. .
Mmmmm….I wonder! I guess most things would taste okay if you were hungry enough. That is a hauntingly beautiful picture of the tree in winter! It is a really interesting and intriguing picture!